No matter how hard we try, the aging process just can’t be stopped. However, making the right lifestyle choices can help you manage and minimize the effects of growing older. A disciplined approach to aging will ultimately lead to a healthier, happier and longer life. 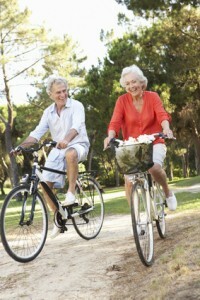 Here are the top ten tips on aging gracefully. Remember That Age is Only a Number: Through the different stages of life, our views on what constitutes “old age” change dramatically. For someone who is age 10, a teacher in her 30s seems old. In our 20s, a 55 year old person is considered ancient. For those in their late 50s, turning 70 still seems like a relatively young age. Exercise Regularly: Aerobic exercises help keep your heart and lungs functioning properly. Engaging in a brisk walk or other low-impact exercises three or four times a week will help improve your mood, enhance your figure and keep you brain stimulated. Eat Healthy: A diet that includes a substantial quantity of fruits and vegetables provides the vital nutrients and minerals needed to maintain good health. Older people often prefer a Mediterranean diet for taste and variety. In any dish, olive oil is preferable to cooking oil. Learn to Relax: Many people report experiencing higher levels of anxiety and depression as they age. To help relax your mind, try meditation, yoga or pilates. Stay Engaged: Participating in community activities through volunteer work, continuing education, social activism or religious association will help you develop close interpersonal relationships while improving the lives of others. Stay Hydrated: Older people have a tendency to dehydrate without feeling thirsty. Drinking eight glasses of water a day will help keep your tissues and vital organs properly hydrated. Accept Yourself: In a lot of ways, older people are survivors who have earned the right to think, look and act the way they want. There is no need to apologize for laugh lines, crow’s feet or deep creases since they represent the different chapters in your life. Be comfortable expressing the fact that you love and accept yourself exactly the way you are. Manage Your Health: Obviously, older people experience more frequent medical issues, so it is important to actively manage your health. This includes regular checkups and addressing new ailments quickly. Also, be careful with prescriptions, which require regular monitoring for safe use. Keep Your Mind Sharp: If you are older, your mind needs regular exercise, which can be accomplished by playing games, reading or continuing your education. Maintain an Active Life: Both physical and mental activity are important in living a healthy and fulfilling life. Finding enjoyable ways to stay engaged can improve your overall attitude and improve health. It’s unfair to try and compare yourself to how you looked when you were younger. For everyone, looks change over time. Rather than dwelling on beauty and youth, appreciate your wisdom and personal growth. Staying fit and eating right will help you remain healthy, which will keep you feeling beautiful regardless of your age.